The REO Blaster's Ohmmeters provide nominal values of circuit RESISTANCE on a large easy-to-read digital display. The user-friendly ohmmeters speed up circuit check-out and provide vital information necessary to assure a successful blast. 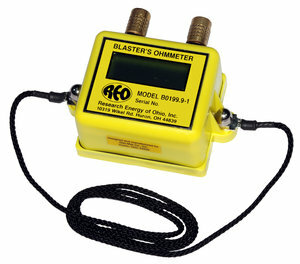 Long battery life, rugged water resistant enclosures and heavy duty terminals provide the blaster with a dependable ohmmeter that provides years of service. [2 lbs. (1 kg.)] 4.1 x 1.3 x 3.6 in. [4 lbs. (2 kg.)] 9.0 x 8.0 x 3.4 in. Digital read-out 0 to 199.9 ohms in 0.1 ohm increments (BO199.9-1 and BO199.9-10) or 0 to 1999 ohms in 1 ohm increments (BO1999-1 and BO1999-10). Laborsaving fast connections for quick hole-to-hole or circuit analysis. Rugged water and corrosion resistant nylon (BO199.9-1 and BO1999-1) or ABS (BO199.9-10 and BO1999-10) plastic case. Safety yellow is easy to spot by equipment operators. Easy-to-follow instructions provided on the unit. Fast battery change using readily available standard ALKALINE battery. Heavy duty bare terminals accept wires, banana plugs, clips or spade terminals. When using the REO BO199.9-1 or BO1999-1 Blaster's Ohmmeter, connect the blasting circuit to the terminals. The ohmmeter turns on automatically. The display indicates the resistance of the blasting circuit. "1---" will be displayed if the resistance exceeds the full scale range of the ohmmeter. The ohmmeter turns off automatically when disconnected. Replace the battery when BAT appears on the display. When using the REO BO199.9-10 or BO1999-10 Blaster's Ohmmeter, connect the sequential blasting cable to the CABLE connector. The ohmmeter turns on automatically. Rotate the CIRCUIT switch to positions 1 through 10, noting the resistance displayed for each circuit. A "1--- " will be displayed if the resistance exceeds the full scale range of the ohmmeter. To measure the resistance of a single circuit, connect the blasting circuit to the SINGLE CIRCUIT terminals and rotate the CIRCUIT switch to the SINGLE position, noting the resistance displayed. The ohmmeter turns off automatically when disconnected. Replace the battery when BAT appears on the display. Low battery drain provides a battery life of more than 2000 hours of operation.